Eurylaimus blainvillii Lesson and Garnot, 1827, Dorey, West Papua. Monotypic. This is the lower altitude member of a pair of sibling species that replace one another altitudinally throughout mainland New Guinea. Despite similarity in appearance and foraging ecology, the two have distinct contact/advertising calls. French: Peltopse des plaines; German: Waldpeltops; Spanish: Peltopo del Valle. 6.5-7.3 in (17-18 cm); 1.1-1.2 oz (30-35 g). 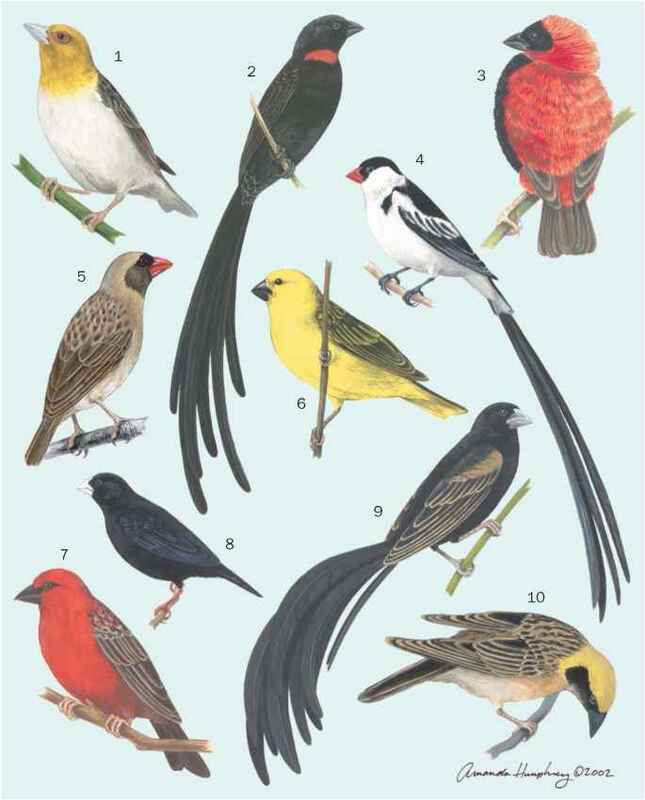 Stout, black, red-eyed flycatcher-like bird with slender tail; patches of white over the ears and on the upper back; and crimson on belly, undertail, and rump. Sexes are alike but juveniles duller. Differs from its montane (mountain-dwelling) sibling species, Pel-tops montanus, in its slightly smaller size, shorter tail, smaller white patches over ears and on back, and much heavier, broader bill. 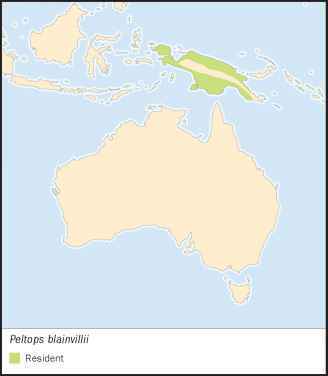 Lowland New Guinea and western Papuan islands up to about 1,640 ft (500 m) above sea level. Primary and tall secondary rainforests, particularly along edges and around openings such as tree falls, stream edges, and road cuttings. Densities have been estimated at two birds per 25 acres (10 ha) in suitable habitat. Widely but sparsely distributed year-round residents; solitary, in loose pairs or small family groups of three to five. Live mostly in top of forest canopies, perching upright and motionless for long periods on exposed vantage perches, from which they fly out in extended sallies. From perches and in flight, birds utter distinctive territorial and advertising calls at regular intervals; calls are a series of three or so well-spaced mechanical double clicks over four to five seconds. At perches, the singer throws its head violently up and down at each click. Other calls include a harsh monarch-like wheeeit, possibly in warning or agitation, and a seldom-heard wrenlike twittering. Apparently wholly insectivorous, birds capture food in the air and from the surface of foliage with the bill on sallying flights. Most foraging is done in and above the forest canopy but sometimes extends to lower strata. Food, including dragonflies, beetles, grasshoppers, and other flying insects, is swallowed whole at a perch, without much beating. Data lacking on timing and duration of events and respective parental contribution. Nests are small, compact cups of twigs and rootlets built in often exposed positions in horizontal tree forks at the ends of branchlets at 20-115 ft (6-35 m) above the ground; and eggs, usually one per clutch, are cream to pale buff, with a ring of black-brown spotting at the larger end.